A few weeks ago I was at Target, when I saw a really cute Christmas decoration. 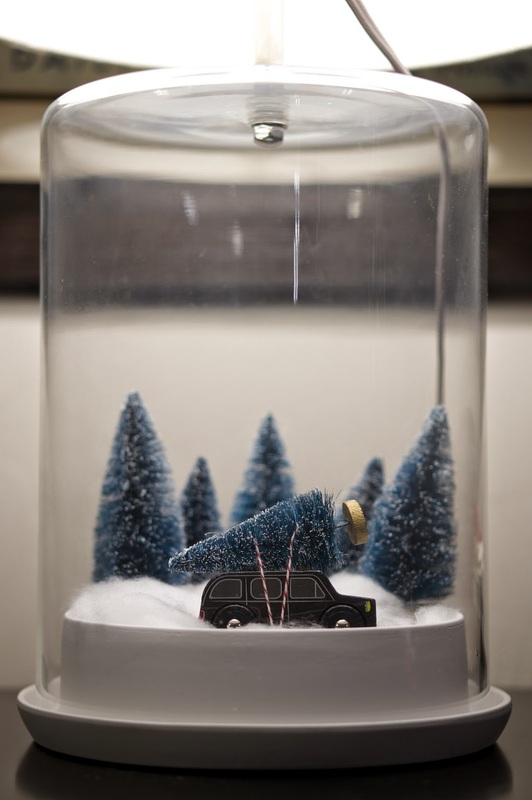 It was a little landscape of a car loaded up with a Christmas tree, driving through a wintery little landscape. And the kicker? It was all contained in a little glass cloche. Adorable! But as cute as the concept was, the execution had a decidedly mass produced vibe to it, so I left it where it was. But then I couldn't quite put the idea of it out of my mind. Could I recreate my own somehow? It turns out that I could, and quite easily! I had the advantage of owning this rather brilliant curio lamp. The class dome comes off and allows us to display something inside. Usually it houses some seashells and a blue glass bottle (sometimes a fish), but it seemed like a good spot to Christmas up a bit, as well as the perfect spot for my little winter wonderland. 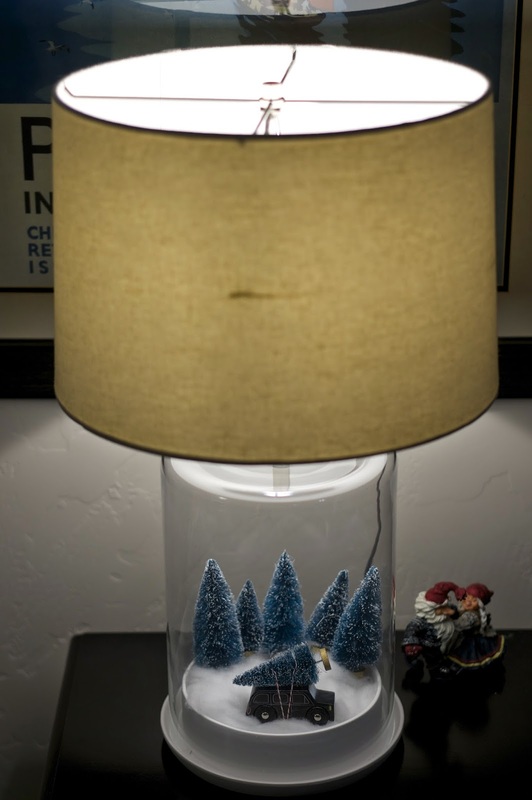 But if you don't have a lamp like this, you could easily use a glass cloche (amazon has a ton), a glass cake dome or even a jar. 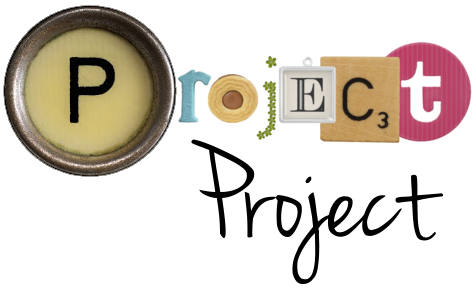 Can you imagine a whole series of tiny landscapes in jars? Or how about inside this big cookie jar? I picked up two packets of different sized bottle brush trees at Hobby Lobby for just a couple of dollars each. Then I set about trying to convince Espen to let me borrow one of his toy cars until Christmas is over. He wasn't completely sure at first, but then once he saw what I was doing, I was granted permission to borrow his wooden London taxi. 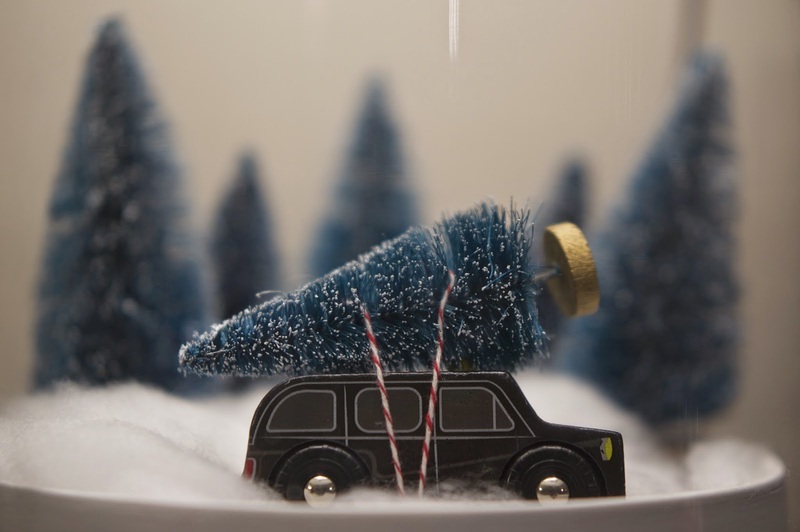 I have to admit I am charmed by the thought of a traditional London black cab driving through a snowy forest to get a Christmas tree. An old timey truck or a red and white VW bus would be really cute too, I think. Knowing a little boy with a copious collection of cars helps a lot with this step. Then I just wrapped a length of string (I used red and white baker's twine for an extra Christmassy vibe) a few times around the car and the tree and tied it underneath. I used white polyester fiber fill (stuffing) that I had lying around from various knitting projects to make the snow, but you could just as easily rip up some cotton balls. 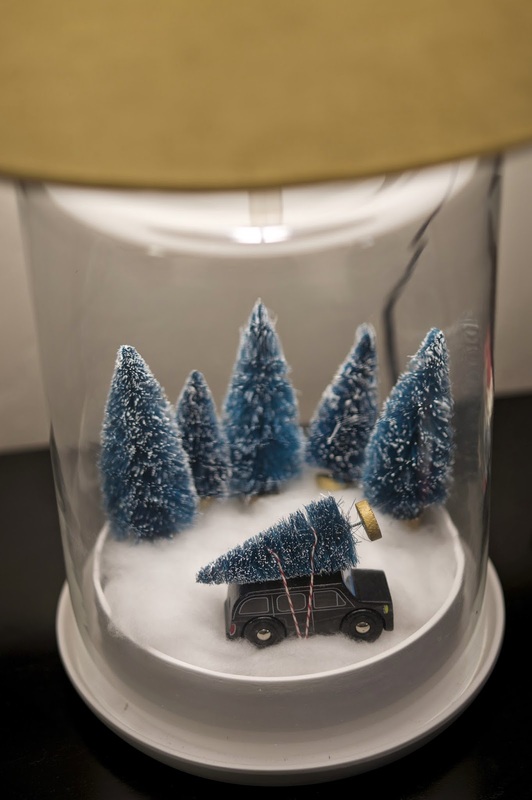 Once the snow was in place I positioned the car and the trees on top and plopped the glass dome into place. Tadah! A winter wonder lamp land. The actual assembling of this project was about 10 minutes, with most of that time being spent on tying the string, and then fussing around and arranging things exactly as I wanted them. And I just love it! It has been catching my eye and making me smile all evening. I posted a picture of it on Facebook, and one of my friends described it as follows: "kinda reminds me of something a little nostalgic and something a little National Lampoon's Christmas", which pretty much perfectly sums up what I was going for. Something cute and Christmassy with just the tiniest hint of not taking itself too seriously. And now I am already plotting what I'm going to put in there for Valentine's Day.